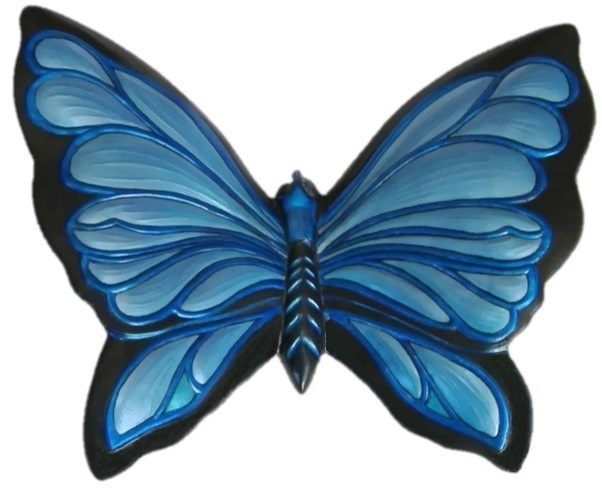 Blue Butterfly Hand-Painted Wall Decor. Hand Painted Wall Decor. Hand-Painted Blue Butterfly. Ceramic. Approximately 8" high 10.50" Wide. Weight: 1 lb Wing Colors: Black, Blues, hues of green and pearl. Body Colors: Black and Blues. Eye Colors: Black with Silver highlights. Finish: Satin. On the back there is a hole for hanging. Makes for a wonderful unique gift or home decor piece. Made and hand-pained in the USA.